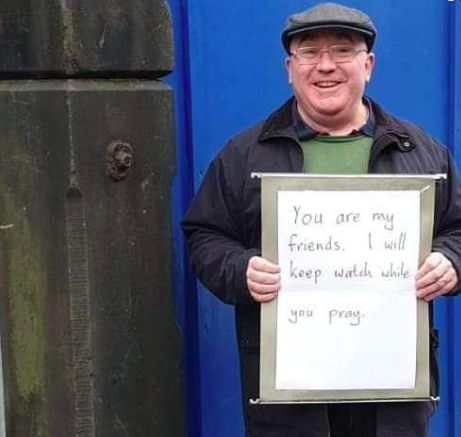 He stood outside the mosque in Levenshulme with the sign as Muslims prayed inside today. It might be a time to say guards and police are routine outside synagogues in the UK. But all you can really says is ‘good on him [note]’. Note: Who he is we don’t know. But the anticipation is that he’ll be hailed and then rubbished. Let’s not all stay in our lanes. Every year a little bit more of the middle ground is ceded, the nuance and grey lost in an ever growing cacophony of outrage, alarm, bigotry and insults that starts on the fringes but leaches its way ever closer to the place where most of us ideologically live. Update: his name’s Andrew Graystone.